BIG Big Finish Week: Doctor Who - THE PARADOX PLANET Review | Warped Factor - Words in the Key of Geek. When you first hear the premise of The Paradox Planet by Jonathan Morris, if it doesn’t strike you as stone cold raving bonkers, you may have been watching too much Moffat Who, or taking too many timey-wimey pills. Check this out: People from the future are sending time tanks back into the past to fight a war against their own ancestors. The further down the road you go in Morris’ company though, the more the madness becomes something beautiful. People have been warning since around the time of Seasons 17 and 18, where this series of Fourth Doctor adventures is aiming to fit in terms of tone, that if we don’t look after our planet, future generations are going to be left in a wretched state, with their air turned to a permanent smog, the sun blazing through a non-existent ozone layer, the weather too extreme for the kind of easy living we know in the West. Essentially, for at least the last thirty years, people have been warning us that if we don’t change our behaviour towards our planet, our children and our children’s children will look back and curse our names for our selfishness and our greed. Morris’ story takes that notion literally on the planet Aoris – as good a science-fiction stand-in for our own world as you’re likely to meet any time soon. Imagine if our grand-descendants actually could come back and give us a piece of their mind. But crucially, the war in The Paradox Planet isn’t a war of destruction. It’s a war of some kind of salvation, some kind of restitution. Imagine if you will that we had the power of time travel. We live on a planet where the actions of man force species to an otherwise unwarranted extinction every year. Imagine we could go back to a time of animalistic plenty, and, Noah-like, pick up a breeding pair of everything magnificent in the world, ensuring the survival of the lion, the tiger, the panda, the giant mastodon, the white rhino, the orang-utan, the dodo? That too is an idea rolled into The Paradox Planet – time travel as an Ark, species plucked out of time just before their extinction, and brought forward, at first to a zoo, and eventually, if the planet’s environment can be repaired, released back into a world that will understand more about what it has, and won’t allow foolishness and greed to rob it of such wonders a second time. Now, don’t get The Paradox Planet wrong – it’s by no means all as worthy as perhaps I make it sound. There are plenty of elements of bonkers fun still intact, quite a lot of time-twisting causality loops to run around, and a good solid helping of elements which actually feel rather more like they belong in a Leela-era story – resistance groups to the ‘time war,’ who follow the will of a godlike entity named Machina, a gentle satire on elements like Xoannon; the Doctor, Romana and K9 being venerated by this group from the ‘future’ and their ‘return’ being prophesied by Machina; the Doctor and his companion being separated on different sides of the conflict and each understanding the viewpoint of ‘their’ side, meaning they are essentially working against each other, and K9 being left behind in the past to travel the ‘slow path’ from era to era at least once – you can only imagine what he’s going to be like when this adventure’s over. Many a tin dog biscuit will be required to return the Time Lord’s best friend to his usual good humour, probably. But in among all the fun, there are those fascinating ideas, and each side gets a chance to make its case, to out-explain each other. Which is where quality of casting comes into play – each side has to be convincing, compelling even, in the arguments they put if a conceit like The Paradox Planet is actually going to work as more than a straightforward story, if it’s going to make you think, and challenge your ideas. Step forward then, Big Finish. If you’re going to try to recreate the tone of Season 17 there is pretty much a single lodestone that outshines all the other stories you could look to in terms of style. That seminal adventure is of course City of Death, which saw the wonderfully dry Tom Chadbon create a Doctor Who legend in private detective ‘Thumper’ Duggan. 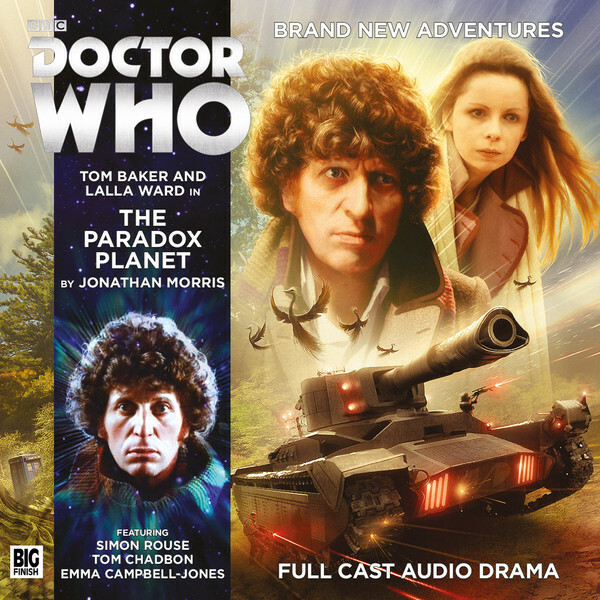 The Paradox Planet isn’t City of Death, but it does reunite Chadbon with Tom Baker and Lalla Ward, the three clearly revelling in their reconnection. Chadbon here plays Embery, the scientist who first makes the breakthrough of time travel, back in the ‘age of greed.’ We learn that after his breakthrough, the knowledge is lost for generations, but Chadbon here plays very much against the memory of Duggan; as we’ve seen in The Mysterious Planet, where his Merdeen was a study in buttoned-down intensity, and since heard in the Blake’s 7 audios, Chadbon’s by no means a limited actor, and here he drives one half of the episode with a fanatical determination not only to discover the secrets of time travel, even if he has to threaten a Time Lady to do it, but also to mount a time-delayed fightback against the aggressors from the future, as he sees them. While there’s logic in the character and sympathy to spare for Embery and his acolytes, of the two sides they come off, perhaps unsurprisingly as they’re closer to our own mainstream mindset, as losers of the argument by virtue of the threats they level at Romana. On the other side of the coin of course, you need someone who can hold his own against such a superb and longstanding story-helper as Chadbon. If you had to name a key performance from Peter Davison’s first season, a very large number of you would put the finger on Simon Rouse, whose rendering of the psychologically unstable Hindle in Kinda was a very human kind of threat in which to ground the action, while things elsewhere got scarily metaphysical with the Mara. That means when you realise its Simon Rouse who’s the leader of the future forces sending time tanks back to attack the past, you’re pretty quickly satisfied that you’ve got a real ball game going on. And Rouse, as Drang, is given the longer speeches in terms of persuasion, in which the notion of the past as the ‘age of greed’ is well explained, as is the nature of the war that’s being fought. There is a third front to be achieved, he says – after saving the animals and taking some resources that the future generation need simply to stave off a crisis situation of starvation in their underground bunkers, he hopes that the planet’s Xenox crystals (handy chunks of science-fiction MacGuffinry which here do double duty as a story-helping avatar for ‘all the solutions to the environmental problems we create’ and ‘the thing that gives these people the power of time travel’), gathered from a past when people had no idea of their capacities, can even be used to undo some of the ecological damage the future finds itself saddled with, and so essentially restore a world fit for all the animals that have been saved. In essence, Drang and his warriors are the provisional wing of a future Greenpeace. As we say, there’s a rationality to Drang’s arguments, urged with both passion and compassion by Rouse, that convinces, but things are never that simple – this is after all part one of a two-episode story, and it should be remembered that there’s a resistance movement against the war, pretty much dictated by the mysterious Machina. What The Paradox Planet delivers is an almost perfect hour of Season 17-style Who, broadly informed by more 21st century concerns and storytelling. It’s never as wantonly funny as, for instance, Wave of Destruction, but it’s never entirely intending to be. It’s the story of the series which has hidden depths and lessons, while still delivering rollicking Who. With Chadbon and Rouse on board and both if anything better than they were in their on-screen stories, (given sterling back up respectively by Laura Rees as Tyrus and especially Paul Banting as Fyrax, who carries much of the eco time war posturing for the first half of the story and does it in such a way it’s both believable and grandstanding), The Paradox Planet is one you’ll melt into, from the barminess of its initial concept to the complexities of its ultimate explanation. It’s also one that will repay repeat listening, the early action having more sense once you actually know what’s going on. This series, the Fourth Doctor Adventures have yet to disappoint. On the evidence of The Paradox Planet, they don’t look likely to do so any time soon.